Connie's World Adventure! 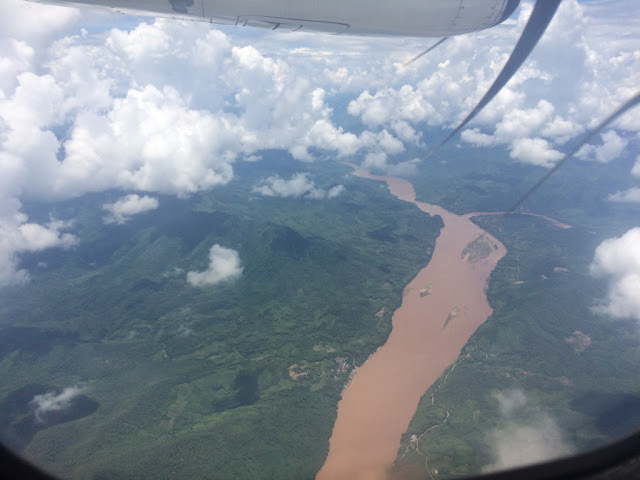 : Luang Prabang, Part 1: I'm In Laos! Officially in Laos! Which fun fact, is pronounced "Lao" and not "Laossssss" the way I'd always said it. Who adds a silent "s" onto words?! 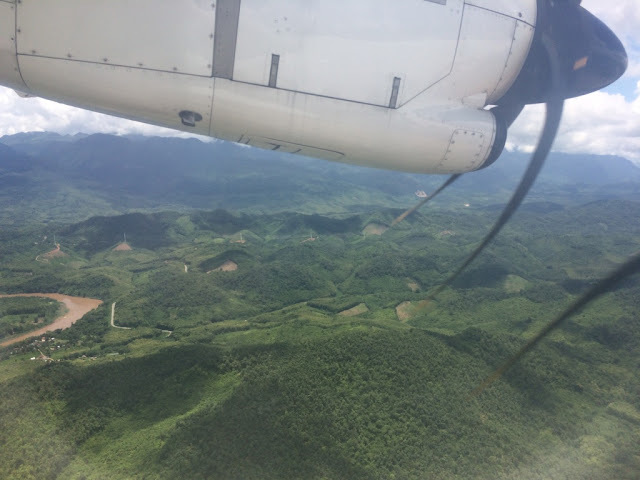 Anyway, I took a direct flight from Bangkok to the city of Luang Prabang in Laos to begin my solo Asian trekking adventure. Asian because I'm in Asia, not because I'm Asian. This is really going to be an adventure because I literally have no plans. I had a flight to Laos, and 3 weeks from now, I have a flight from Cambodia to Taiwan. Nothing in between - no hotels, flights, buses, tickets, or even any idea of what I'll be doing. I know I'll spend some time in Laos, then head to Vietnam, then Cambodia - but it's all on my own schedule. I am truly, truly winging it - so wish me luck. I hope my OCD life can adjust to this. Luang Prabang is a city in Northern Laos - it's a UNESCO World Heritage Site because it is SO CUTE (official reason). The city itself is super small, only about 50K residents - but it draws tourists in through how charming the town is (there's a ton of French architecture from its colonial days), and the amount of outdoor activities there are to do. You can trek, visit waterfalls, spelunk in caves, visit hill tribes, bike, kayak, see elephants, etc. Yeah, I didn't take this. 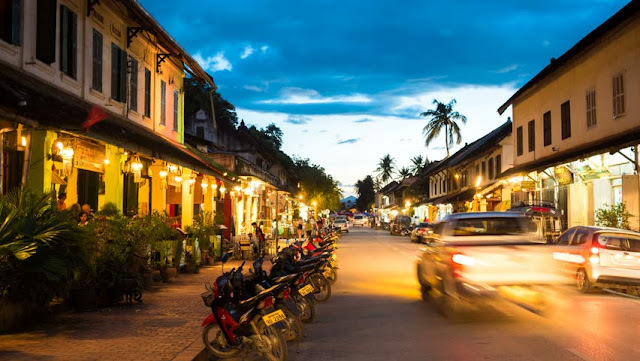 But how cute is Luang Prabang's main street!? Also a fun fact about Laos, there are 149 separate ethnic groups that comprise the population. 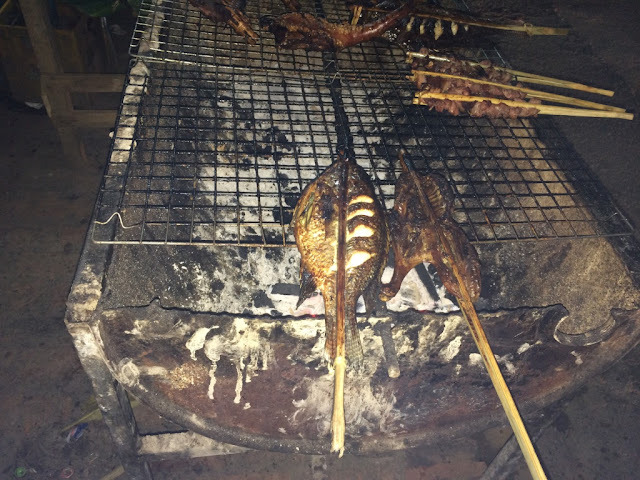 Therefore, while everyone can speak Lao, most also have another language/dialect of their own ethnicity they can speak. Some of the major groups are Hmong, Khmu, etc. It's like a country that's a giant melting pot of ethnic groups. An hour 15 minute flight landed me in Luang Prabang around early afternoon. 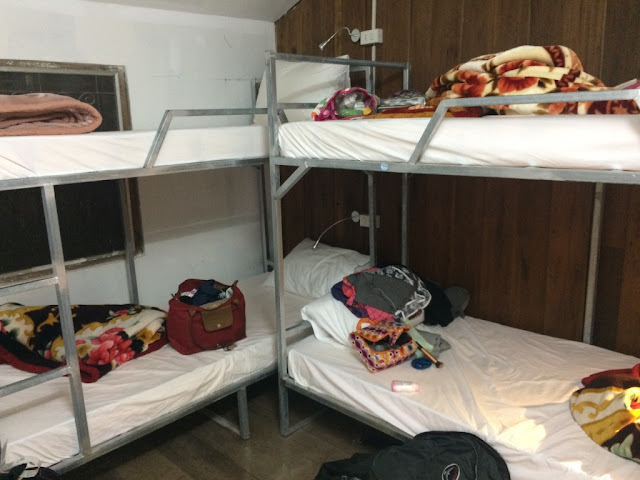 Checked into my hostel, which was a huge difference from everywhere else I've stayed. I shouldn't have started my travels in Eastern Europe, because hostels there are super fancy, super nice, and super boutique-y. This one was definitely in another league. Our room is the size of a closet (I am sleeping with my face about a foot away from the next girl), the A/C only works after 10pm (therefore the room is sauna-esque), and there are no lockers in the room. Did I mention the incredibly hygienically-questionable bathroom? Welcome to your new life, CW. Annnd my complaining ends there because the rest of the afternoon I spent wandering through the town - I had a fruit shake and coconut ice cream, got a massage - you know, really eased myself into life here gently. Then I stopped by the organization Big Brother Mouse to volunteer (see below). I had read earlier in my Lonely Planet about an organization here in town called Big Brother Mouse. It's this incredible organization that was started in Luang Prabang in 2006 - when a retired American publisher visited Laos and noticed none of the children were reading. When he asked around, he was told that kids just didn't read - not only that, there was a serious dearth of children's books written in Lao (read: none). So he started Big Brother Mouse to engage children in reading and improve literacy - the organization started writing children's books in Lao, donates books to villages without them, and seeks to make Laotian people independent. Twice a day every day, you can drop by the Big Brother Mouse office to speak and practice English to promising young students. I thought I'd drop by and see what was going on. I showed up at the office, and the employee basically was like "Here's a chair. Here are students. Go." Thrown into the lion's den. The issue was that the employee had given me a chair at the front of the room - so any students who came in pulled up a chair and sat with me. I was probably holding court with about 8 students (compared to the 1-2 students the other 3 volunteers had each). It was, in one word, incredible. The students I spoke to ranged in age from 15-22, and I've never met people so eager to learn. They choose to show up to Big Brother Mouse - it's not a requirement or anything, and they were rapid firing me questions left and right. The questions ranged from complex vocab definitions, to very personal questions about my life. Not only was their English so, so good - but many hadn't even been learning it that long. One kid was chatting away with me in super-clear, super impressive English - and he'd only been learning it for 3 months. On top of that, many of these kids are learning several languages - the most popular being English and Chinese. So most of them could speak English, Chinese, Lao, their indigenous language (most of my kids were Hmong so they speak that), Thai (because that's what they watch on TV), and one additional language (ranged from Japanese to French to Spanish). I've never been so impressed before. Many of them came from small countryside villages, and wanted to improve their English for university or a job. I loved it. I seriously loved everything about it, and was so glad I stopped by. There is something so inspiring about kids who are so hungry for knowledge. One kid asked me if I painted my teeth because they were so white. Not even a kid, this guy was 22. I said no, so he was like "Soooo you have never had coffee before?" I said I did drink coffee, so then he asked, "Sooo do you just brush your teeth 10x a day?" It was amazing. He couldn't get past it. Pretty sure another one was hitting on me. He kept telling me I was gorgeous, then asked if I was single, then told me I looked 20, then made his friend take several photos of us after class - and then after the session was over, he offered to give me a ride on his motorbike. They all have the mantra "No money, no honey" that they kept saying. They all claimed to be single, and said they had to make the big bucks before finding a girlfriend. The students all seemed so worldly and so good at English, but sometimes when I was talking, I realized they had no concept of anything I was talking about. They have zero idea what snow was (besides having seen it on TV), and most had never been outside Laos (save for one or two that had been to Vietnam to go shopping) - so being on a plane, or where the USA was, or any of that was totally foreign. The best part was, after class, an older lady (maybe late 30's) who had come in late shyly asked me if I would go get dinner with her so she could talk to me some more. Of course. Duh. 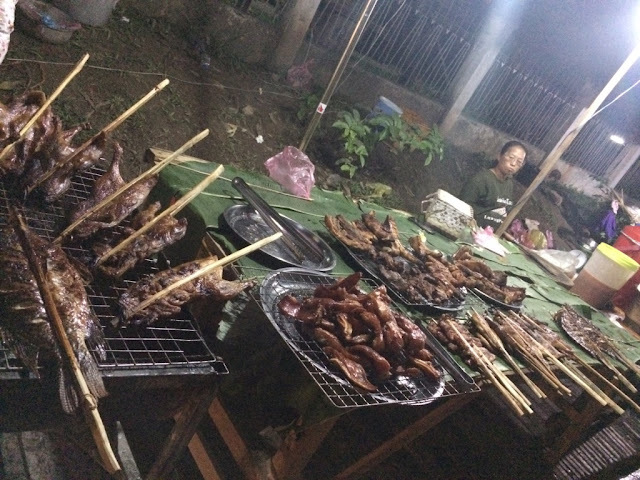 She took me down this side alley to a street market, and chose a BBQ stall which had a tiny table and small plastic stools. We ended up sitting and talking for about 2 hours. By "we", I meant her. I mainly listened. She had so, so much to say - it was hard to understand it all, but the jist was that she left her family because she wanted to be independent and help the people of Laos. She currently works in Luang Prabang working long hours in a textile organization that helps Laotian women develop skills for jobs. After a 9-10 hour working shift, she goes to English class every day, and drops by Big Brother Mouse any chance she gets. This woman is relentless. She had so much to say about how corrupt the Lao government is, the things she's seen, etc. - she's a huge, huge champion for education and helping Lao's youth. She lives alone, so far from her family, unmarried, struggling to get by, and said she didn't really have any friends because she isn't from this part of Laos - but she goes on because she wants to be independent and wants to help and wants a better future for her country. She truly believes good things will happen to her if she just keeps going. The thing that touched me the most was the very normal, everyday things she talked about - how she wishes she had a boyfriend but doesn't meet good men, how she can't afford all her rent but she has an agreement with the landlord, how she wants so much more. It was a really, really inspiring day.